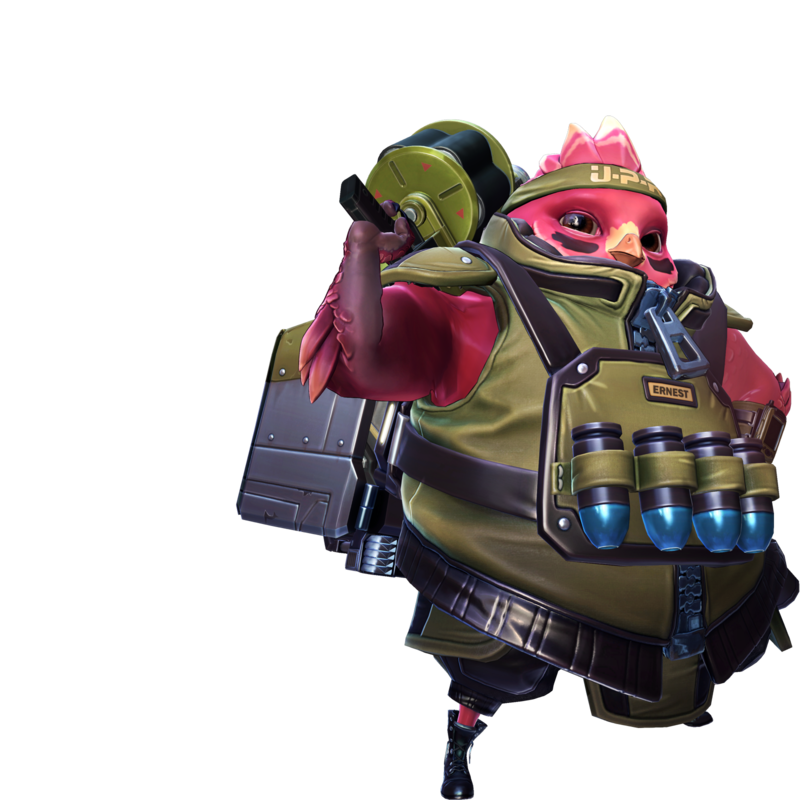 Some might call him a well-aged boy scout, but Ernest’s sense of honor and duty brings a new means of support and defense previously absent from the Peacekeepers – this is no small part thanks to his grenade launcher. The various explosive charges help Ernest lean on the offensive or provide a mean line of defense for his team. Grenades that directly hit an enemy deal additional damage. Ernest’s trademark UPR Grenade Launcher launches explosive canisters that detonate on impact with an enemy, or after a short delay. Ernest’s Detonator can be used to detonate deployed Explosive Charges or switch between Power Egg modes. Deploys a beacon that imparts bonuses to allies in range. Attack Mode boosts attack speed, while Defense mode reduces damage taken. Heave an explosive charge that sticks to the world and enemies. Detonates upon activation of Ernest’s Detonator, dealing damage to enemies in range. Deploys a grid of mines that explode on contact with an enemy, each dealing damage. While in Attack Mode, Power Egg grants a movement speed boost to allies in range. While in Defense Mode, Power Egg slows enemies in range. Increases Grenade Launcher magazine size. Detonating an Explosive Charge will also detonate any other deployed Explosive Charges in range. Enemies damaged by Direct Hit are wounded for a brief time. Increases Grenade Launcher attack speed. Adds a defensive shield to Power Egg’s Defense and Attack Mode. Increases Explosive Charge’s blast radius. Enemies damaged by Mine Grid mines are slowed for a brief time. Explosive Charges push enemies and Ernest away from the blast when detonated. While in Attack Mode, Power Egg grants an attack damage boost to allies in range. Direct Hit will now trigger when impacting enemies after a single bounce on the ground. Increases the maximum number of Explosive Charges that can be active on the battlefield at once. Direct Hit reduces Explosive Charge’s cooldown. Deployed Explosive Charges reveal nearby enemies, and automatically detonate if the target remains within range. Increases Grenade Launcher reload speed. Increases the damage reduction boost imparted by Power Egg’s Defense Mode. Increases damage dealt by Explosive Charge. Each Mine Grid mine that damages an enemy increases the damage dealt by subsequent mine explosions.